A lone runner practicing on Gallows Lane. Courtesy of the Hartford Courant. A seventh mile featuring Gallows Hill is certainly an ominous way to end a road race, and the historian, trained to be a skeptic, wonders if the appellation survives a historical inquiry. It does, as Gallows Hill was the scene of three of the four widely documented executions in Litchfield. The pillory, a frequently used method of punishment in early America. There are many instances in Litchfield history of the gallows being used for punishment that did not quite rise to the level of execution. For example, Sheriff Lynde Lorde wrote in February 1776, “I caused the within named John Thomas to be taken from the common Gaol in Litchfield to the place of Execution and there Set upon a Gallos with a Rope Round his Neck for the full Term of one hour and Then tied to the Tail of a Cart and Transported to four of the most public places in the Town of Litchfield and there whipped on his naked body Thirty-nine stripes in the whole.” Other uses of the gallows were more extreme. In 1768, John Jacob, a Native American, became the first documented prisoner to be hanged in Litchfield. On February 17th of that year he killed Jacob Chokerer, a member of the Schaghticoke tribe in Kent with a hatchet. A map of Litchfield at the time of the Davenport trial. Note the church and the courthouse in the center of town. Courtesy of Yale University. One of Connecticut’s most brutal and best known crimes saw its climax come on Gallows Hill in 1780. Barnet Davenport had served with George Washington’s Continental Army until he deserted and became a live-in worker with Caleb Mallory’s family in Washington, Connecticut. In early February of that year, Mallory arranged to have several members of the Mallory family leave on a trip, while he killed Caleb, his wife Jane, and their three granddaughters. He then gathered up the family’s valuables and set fire to the house, believing that if the entire structure was destroyed, investigators would think that he had also perished in the fire. He fled to Cornwall, but was captured while sleeping in a cave. He was sentenced to 39 lashes before being hanged on the gallows. This illustration depicts the short-drop gallows, designed to kill the condemned through strangulation, an exceedingly painful enterprise. It was used for Litchfield’s first three executions. Five years later, Thomas Goss, a Barkhamsted tavern keeper from Barkhamsted, was convicted for the ghastly crime of splitting his wife’s head open with an ax, then smearing her blood on the couple’s three children who were sleeping in the bed with their mother. He later told the authorities he committed the act because his wife was a witch, and he was acting only to save the children. 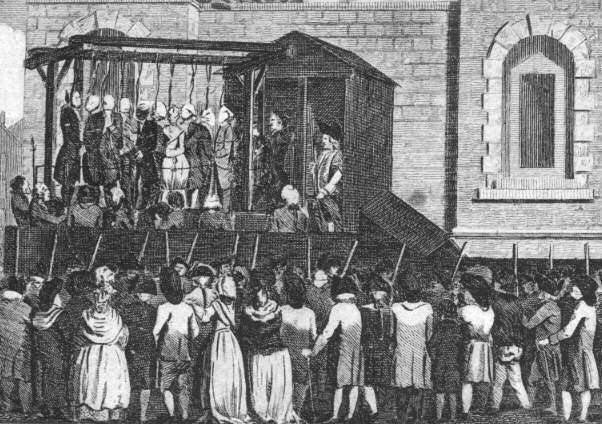 Goss was sentenced to death by the gallows on November 7th, 1785, but swore that the sheriff would never be able to carry out the act, as Goss was in fact that brother of Christ and that the Heavenly Father would intercede to save Goss and kill 30,000 men in retribution. Sheriff Lorde soon disabused Goss of these notions. 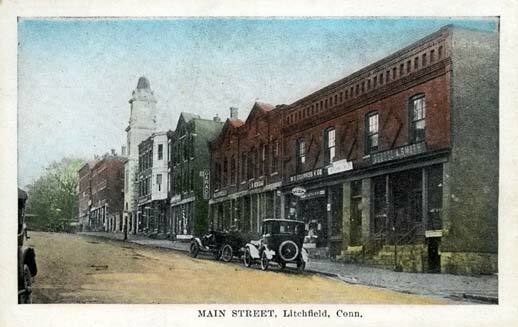 For more on crime and punishment in early Litchfield, see my forthcoming book, Wicked Litchfield County (History Press, July 2016). For more information on the history of the Litchfield Hills Road Race, see Lou Pellegrino’s book A History of the Litchfield Hills Road Race: In Smallness there is Beauty (now available at the Litchfield Historical Society).